Absolutely stunning – you do seem to get some amazing sky pictures. I think I risk coming across as a sky-obsessive! That’s beautiful. Love the contrasting colours either side of the rainbow. Thanks. It was one of those ‘Stop the car!’ kind of moments. Just had to try and capture those colours. WOW! That is incredible! Beautiful photograph and well done you for capturing it! Wow, that is just amazing!? what a truly beautiful shot! Lovely photo – well captured! Completely AMAZING! Wow wow wow, would love to try and capture a sky like that! 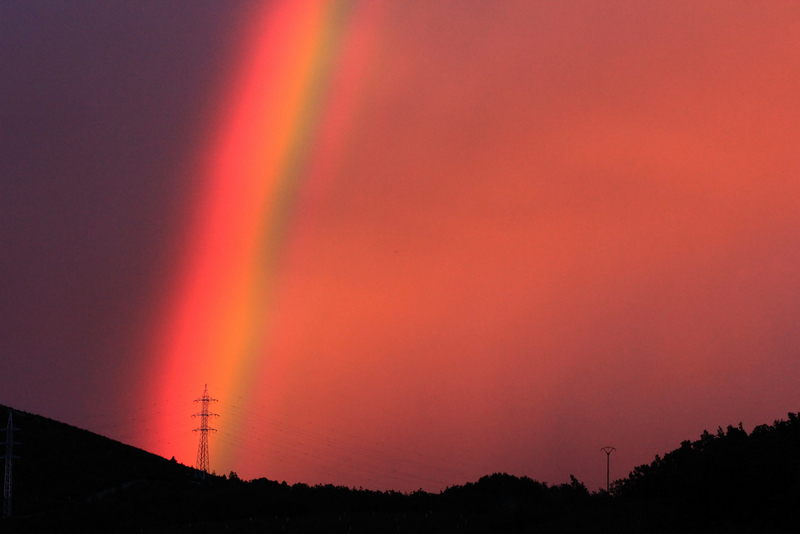 Fantastic shot, I’ve never seen a rainbow and such a beautiful red sky at the same time! thats one ‘blinding’ sky! Is it still super hot? Stunning! Compared to Irish skies, it could be Mars. Only wonder and awe and gasping could I offer up to celebrate the glory of this fiery rainbow! Amazing photo, it must have been tremendous seeing such beauty with your own eyes! Thanks for sharing.